Sid Phillips - who served with H Company, 2nd battalion of the 1st Marine Regiment, 1st Marine Division - turned 18 during the Battle for Guadalcanal. A survivor of that campaign, he was also a veteran of the fight for Cape Gloucester. After the war, he became a family-practice doctor in Mobile, Alabama. I was determined the war was not going to ruin my life. We used to say nothing could be worse than being in the jungle, and that feeling carried me through life. Nothing was a problem after that. Resting in Melbourne (after Guadalcanal) and at Pavuvu (following Cape Gloucester), he saw his good friend Eugene Sledge before "Sledgehammer" was sent to fight at Peleliu. Both wrote books about their experiences. Sid's is entitled You'll be Sor-ree. In this historical footage of the war, compiled from the U.S. National Archives, Sid tells us what it was like at Guadalcanal. We also learn that many sailors - about 5,000 of them - lost their lives during sea battles at Guadalcanal. 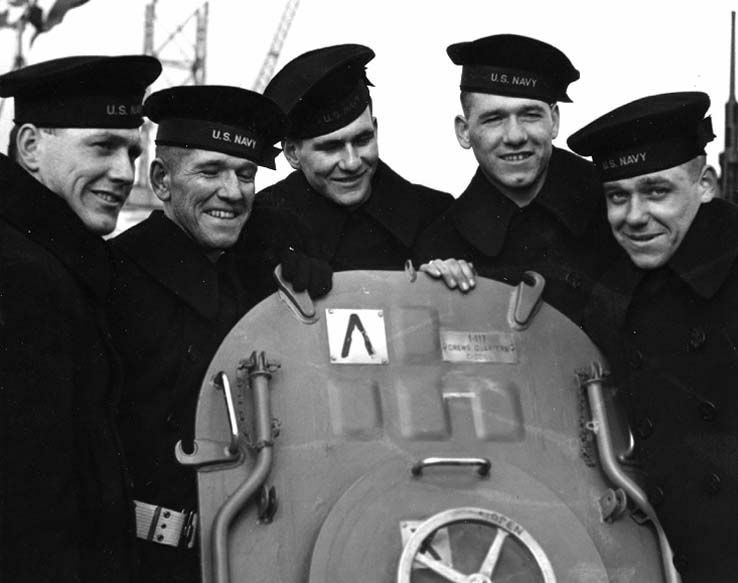 Five brothers - Joseph, Francis, Albert, Madison and George Sullivan (depicted, left to right, in this National Archives' photo - all died when their ship, the USS Juneau (CL-52) was fatally attacked by Japanese torpedoes on the 13th of November, 1942. Japan also lost thousands of men during the naval battle. When Japan could no longer resupply its forces, serving at Guadalcanal, the battle for the island was over. In a costly victory, the Allies had stopped Japanese expansion in the Pacific. They had also learned how to defeat the Imperial forces in the air, on the water and in the jungles. Video clip from The War - "A Very Fearful Time" (excerpted from Episode 1, "A Necessary War"). Online, via Australian Broadcasting Company (ABC1). Copyright WETA, Washington, DC and American Lives II Film Project, LLC. All rights reserved. Clip used here as fair use for educational purposes and to acquaint new viewers with the 2007 production. The War - Directed by Ken Burns and Lynn Novick - available in DVD and supporting book (online, courtesy Google Books). Bos, Carole "Sid Phillips - A Fearful Time" AwesomeStories.com. Oct 07, 2013. Apr 25, 2019.